Socialism Gets a Second Life Why do the young love Bernie Sanders? Because their experience of capitalism is different. I was watching Bernie Sanders speak last week at a town hall in Bedford when an early intuition became a conviction: Take Mr. Sanders seriously. He is not just another antic presence in Crazy Year 2016. His rise signifies a major shift within the Democratic Party. The big room was full, 700 to 800 people, good for 5 p.m. on a Friday. The audience wasn’t raucous or full of cheers as at his big rallies, but thinking and nodding. They were young and middle-aged, with not many white-haired heads. There was a working-class feel to them, though Bedford is relatively affluent. “Let me disabuse you,” Mr. Sanders says to those who think he cannot win. He quotes New Hampshire polls, where he’s way ahead. He can defeat Donald Trump, he says. The audience is attentive, supportive. “Yeah!” some shout. No one mentions ObamaCare, but it seems clear it hasn’t worked here. How to pay for it all? “Impose a tax on Wall Street speculation,” he says, briefly. He does not elaborate and is not pressed to. Mr. Sanders’s essential message was somber, grim, even dark. It’s all stark—good guys and bad guys, angels and devils. But it’s also clear and easy to understand: We are in terrible trouble because our entire system is rigged, the billionaires did it, they are the beneficiaries of the biggest income transfer from the poor to the rich in the history of man, and we are going to stop it. How? Through “a political revolution.” But a soft one that will take place in voting booths. We will vote to go left. As the audience left they seemed not pumped or excited, but satisfied. I listen to Mr. Sanders a lot, and what he says marks a departure from the ways the Democratic Party has been operating for at least a generation now. Formally, since 1992, the Democratic Party has been Clintonian in its economics—moderate, showing the influence of the Democratic Leadership Council. Free-market capitalism is something you live with and accept; the wealth it produces can be directed toward public programs and endeavors. The Clinton administration didn’t hate Wall Street, it hired Wall Street. Big government, big Wall Street—it all worked. It was the Great Accommodation, and it was a break with more-socialist approaches of the past. All this began to shatter in the crash of 2008, not that anyone noticed—it got lost in the Obama hoopla. In March 2009, when Mr. Obama told Wall Street bankers at the White House that his administration was the only thing standing between them and “the pitchforks,” he was wittingly or unwittingly acknowledging the Great Accommodation. The rise of Bernie Sanders means that accommodation is ending, and something new will take its place. Surely it means something that Mr. Obama spent eight years insisting he was not a socialist, and Bernie Sanders is rising while saying he is one. It has left Hillary Clinton scrambling, unsteady. She thought she and her husband had cracked the code and made peace with big wealth. But her party is undoing it—without her permission and without her leading the way. She is meekly following. It is my guess that Mr. Sanders will win in Iowa and New Hampshire. But the tendency he represents—whether it succeeds this time or simply settles in and grows—is, I suspect, here to stay. I disagree. It’s back because it’s new again. For so many, 2008 shattered faith in the system—in its fairness, usefulness and efficacy, even in its ability to endure. As for the young, let’s say you’re 20 or 30, meaning you’ll be voting for a long time. What in your formative years would have taught you about the excellence of free markets, low taxes, “a friendly business climate”? A teacher in public high school? 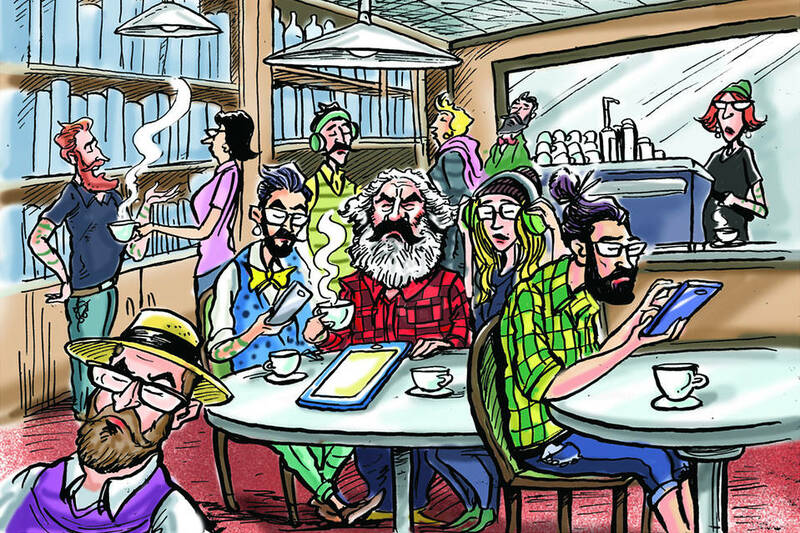 Maybe one—the faculty-lounge eccentric who boycotted the union meetings. And who in our colleges teaches the virtues of capitalism? If you are 20 or 30 you probably see capitalism in terms of two dramatic themes. The first was the crash of ’08, in which heedless, irresponsible operators in business and government kited the system and scrammed. The second is income inequality. Why are some people richer than the richest kings and so many poor as serfs? Is that what capitalism gives you? Then maybe we should rethink this! And Mr. Sanders makes it sound so easy. We’re rich, he says; we can do this with a few taxes. It is soft Marxism. And it’s not socialism now, it’s “democratic socialism” like they have in Europe. You’ve been to Europe. Aside from its refugee crisis and some EU problems, it’s a great place—a big welfare state that’s wealthy! The French take three-hour lunches. Socialism is an old idea to you if you’re over 50 but a nice new idea if you’re 25. Do you know what’s old if you’re 25? The free-market capitalist system that drove us into a ditch. Polls show the generation gap. Mr. Sanders does poorly among the old. They remember socialism. He does well among the young, who’ve just discovered it and have little to no knowledge of its effects. A nationwide Marist poll in November showed Mr. Sanders already leading Mrs. Clinton, 58% to 35%, among voters under 30. She led him among all other age groups, and 69% to 21% among those 60 and older. By this month a CBS/New York Times poll had Mr. Sanders up 60% to 31% among voters under 45. Bernie Sanders is an indicator of the Democratic future. He is telling you where that party’s going. In time some Democrats will leave over it, and look for other homes. It’s all part of the great scrambling that is happening this political year—the most dramatic, and perhaps most consequential, of our lifetimes.